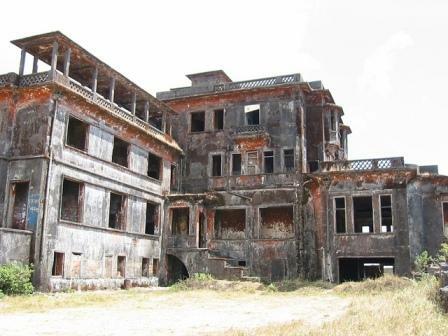 Bokor Hill Resort or Station (in Khmer កស្ថានីយភ្នំបូកគោ Kosthany Phnom Bokor) is a French ghost town in Preah Monivong National Park, southern Cambodia. 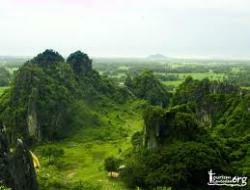 Construction started in 1921 on Dâmrei Mountains, about 20 km as the crow flies (42 km by the road) West from the town of Kampot. It was used as the location for the final showdown of the movie City of Ghosts (2002) and the 2004 film. The town was built as a resort by the colonial French settlers to offer an escape from the heat, humidity and general insalubrity of Phnom Penh. Nine hundred lives were lost in nine months during the construction of the resort in this remote mountain location.The centrepiece of the resort was the grand Bokor Palace Hotel & Casino, complemented by shops, a post office (now demolished), a church and the Royal Apartments. 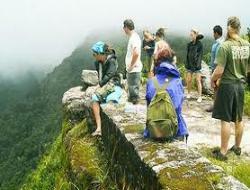 It is also an important cultural site, showing how the colonial settlers spent their free time.Bokor Hill was abandoned first by the French in late 1940s, during the First Indochina War, because of local insurrections guided by the Khmer Issarak, and then for good in 1972, as Khmer Rouge took over the area. During the Vietnamese invasion in 1979, Khmer Rouge entrenched themselves and held on tightly for months. In earlier 1990s Bokor Hill was still one of the last strongholds of Khmer Rouge.